We've gone to extraordinary lengths. And widths. Sit down in front of the new iMac and something incredible happens: The world around you seems to disappear, and you lose yourself in the big, beautiful display. To create an experience this immersive, we pushed every limit, rethought every detail, and advanced iMac in the most astonishing ways. The first iMac was a revolution: An all-in-one computer that put everything - display, processor, graphics, storage, memory, and more - inside one simple, stylish enclosure. Countless innovations later, we've raised the bar yet again. The new iMac includes the most advanced, most brilliant desktop display we've ever built, and it's filled with the latest high-performance technologies. Yet it's just 5 mm thin at its edge with up to 40 percent less volume than the previous generation. To do all that required unprecedented feats of engineering - and imagination. We invented new technologies, pioneered new manufacturing techniques, and devised all-new ways to do more in less space. Innovations at the molecular level. One of the biggest challenges our engineers faced was how to join the front and back of the new iMac. The enclosure is so thin, it's not possible to weld the pieces using traditional methods. So we searched far and wide for other ideas, and we found one in a process called friction-stir welding. It's commonly used on airplane wings, rocket booster tanks, and other parts that simply can't fail. This process uses a combination of intense friction-generated heat and pressure to intermix the molecules of the two aluminum surfaces - creating a seamless, precise, and superstrong join. You may not see it, but the new iMac wouldn't be possible without it. A story you can really lose yourself in. Now you're closer to the action. The new iMac display is not set behind the cover glass - it's right up against it. The LCD itself is 5 mm thinner than before, and we used an advanced process called full lamination to eliminate a 2-mm gap between the LCD and the glass, something that has never been done on a display this large. Although it may not seem like much, those few millimeters are enough to make images look as if they're leaping off the glass. Full lamination has a second major benefit: It eliminates the reflection of light off the LCD panel and off the back of the display's cover glass. But we also figured out how to reduce reflection off the front of the glass without compromising color quality. Instead of applying an antireflective coating to the glass in a conventional way, we adapted a process used on smaller surfaces like camera lenses and fighter pilots' helmets. It's called plasma deposition, and it involves coating the glass with layers of silicon dioxide and niobium pentoxide so precise and so thin they're measured in atoms. The result: an astounding 75 percent reduction in reflectivity - and vibrant, accurate colors. Easy on the eyes. Actually, phenomenal. You won't want anything to distract you from what you're viewing on these big, beautiful 21.5- and 27-inch displays. And nothing will, thanks to a new display design that reduces reflection by 75 percent. In addition, because the LCD now sits right up against the glass, your content seems to leap off the screen. The gorgeous iMac display looks great from any seat in the house. A technology called in-plane switching (IPS) gives you a bright picture with excellent color from nearly any angle. And LED backlighting offers instant-on, uniform brightness with no waiting. So you're always ready to share that vacation slideshow with the family. Vivid, true-to-life color. Every time. Everything you see on the big, glossy display - from skin tones and dark shadows to bright blue skies and green fields - is rich and vibrant. And the colors are more true to life, too. 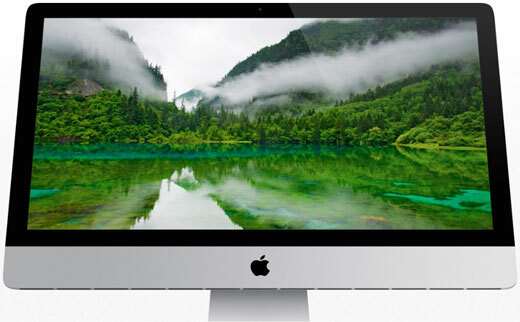 That's because every iMac display is individually color-calibrated using state-of-the-art spectroradiometers to match color standards recognized around the world. Up to 60 percent more powerful. 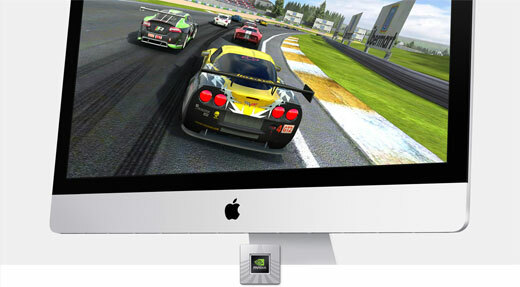 Across the line, the new iMac features advanced NVIDIA GeForce graphics processors built on the Kepler architecture, delivering up to 60 percent greater performance for graphics-intensive tasks. Youll see more frames per second in 3D games, and you can edit HD home videos with more speed and responsiveness than ever before. Hard drive. Flash. Or the best of both. Up to a 3TB hard drive. Go ahead and take all the photos, buy all the music, and shoot all the video you want. A 1TB hard drive comes standard on the new iMac, with the option to upgrade to a massive 3TB drive - which is 50 percent more storage than ever before offered on iMac. Up to 768GB of flash storage. For maximum performance, you can configure a 27-inch iMac with 768GB of flash storage instead of a traditional hard drive. Flash storage delivers up to three times the performance of a traditional drive - speed you'll notice when you start up your iMac, launch an app, or browse your photo library. The new iMac introduces a breakthrough storage option called Fusion Drive, which combines a high-capacity hard drive with high-performance flash storage. Fusion Drive automatically and intelligently manages your data so that frequently used apps, documents, photos, and other files stay on the faster flash storage, while infrequently used items move to the hard drive. You'll enjoy shorter boot times, and as the system learns how you work, you'll experience faster application launches and quicker file access. The most advanced high-speed I/O. Ultrafast and ultraflexible, the tiny Thunderbolt port offers unprecedented transfer speeds and incredibly versatile expansion capabilities. Connect high-performance peripherals such as external drives, cameras, audio and video capture devices - even Mini DisplayPort displays for more screen real estate. 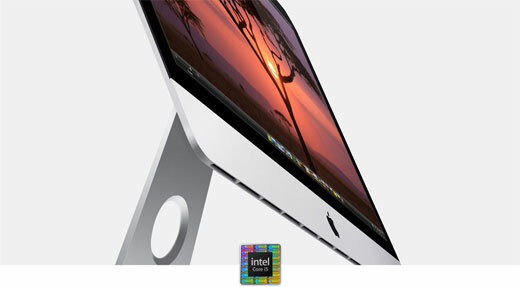 All iMac models include two Thunderbolt ports, so you can create the ultimate do-anything desktop. Bring on your printer, digital camera, mobile phone, and external hard drive. 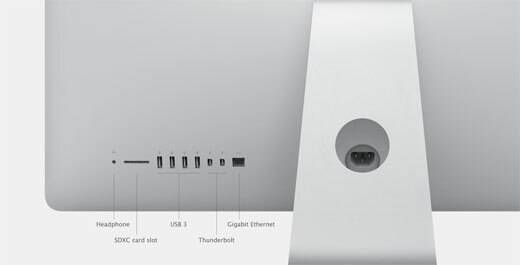 Every iMac comes with four USB 3 ports - with speeds up to 10 times faster than USB 2 - so you'll have plenty of peripheral possibilities, including your iPhone or iPod, printer, or Apple USB SuperDrive. 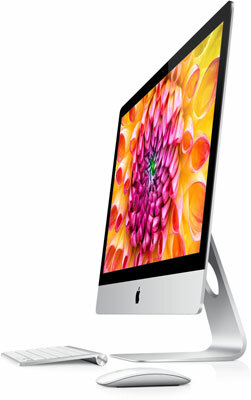 The latest 802.11n wireless technology in iMac makes it effortless to connect to a Wi-Fi network. Bluetooth 4.0 wireless technology is also built in, so you can use your favorite wireless accessories - such as the Apple Wireless Keyboard and Magic Mouse - right out of the box. We've made things even more perfectly clear. 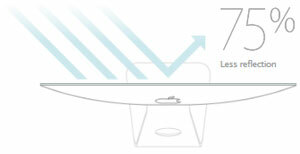 Higher-fidelity sound and a larger soundstage. Even though the iMac enclosure is thinner than ever, the new built-in speakers deliver higher-fidelity sound than before. So when you're listening to that new album, watching the latest flick, or playing your favorite action game, you'll get immersive sound and a surprisingly wide soundstage. Dual mics. Be heard loud and clear. Get everyone in the picture with crisp, widescreen HD video. The built-in 720p FaceTime HD camera lets you make video calls that are so clear, it seems like everyone's in the same room. 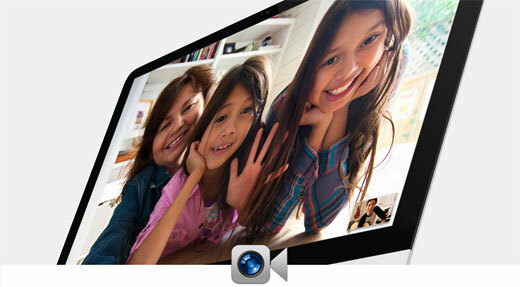 Make FaceTime calls from your iMac to any FaceTime-enabled Mac, iPhone, iPad, or iPod touch. The world's most advanced desktop operating system. 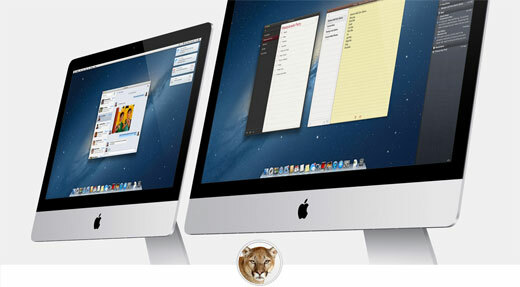 OS X Mountain Lion takes full advantage of the incredible technologies in every Mac. It makes a powerful computer intuitive and easy to use. It makes Multi-Touch gestures on the trackpad feel fluid and natural. It makes it easy to find, organize, share, and do just about everything. And thanks to iCloud, it makes your Mac, iPhone, iPad, and iPod touch work wonderfully together.